This week, our family has been stuck inside with the flu. The tough task is keeping my boys in bed and entertained. I have a "sick basket" that I stock with coloring books, cards, games, and a few Power Rangers to help fight off germs. I even throw in a favorite stuffed animal and a light weight blanket. I stock our kitchen with "sick food" essentials like fruit popsicles, soups, mac n' cheese, crackers and juice. I try and make the best of a bad situation. Here are reviews on two of my favorite "stuck in the house" craft items. The Puppet set by Alex includes five colored bags, 260 colorful stickers, one chunky glue stick, punch outs and simple illustrated instructions. The suggested age range is 3 and up. The set is available at Target for $10.49. Our family loved this product, and it makes a wonderful gift. My boys spent hours creating these puppets. Then, they enjoyed putting on shows. The quality is excellent, and the designs are bold, colorful and fun. Bravo! Manage the mess of your budding artist with the Land of Nod art mats. Even though my boys have a craft table in their room, they love to create on our dining room table. 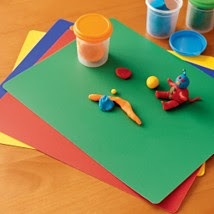 Whether it's paint or play dough, they enjoying using these non-skid mats. I like that they keep the art off my table, and I can throw them in the dishwasher. The set includes a blue, red, green and yellow mat. 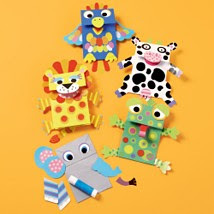 Combine with the puppet set (also available at Land of Nod) for a great gift! The Puppet Set is adorable! My toddler grandchildren would love it. I will have to look for them the next time I go to Target.